Is This The Last PS2 Game Magazine Cover? Who would have thought that this late in the console's life cycle that a PlayStation 2 game would make the cover of a major gaming publication? 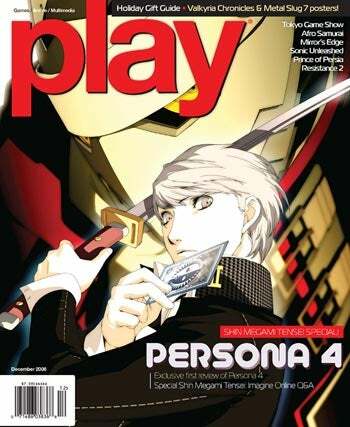 The latest issue of Play magazine features Atlus' upcoming RPG Persona 4, with a whole slew of special Shin Megami Tensei-themed features packed inside. It's really an odd sight to see, especially considering the other games listed in the top-right corner of the cover - Afro Samurai, Mirror's Edge, Resistance 2, Sonic Unleashed, and Prince of Persia - all big name, current generation titles. I get the feeling this is a sort of swan song for the aging console, but what do you guys think? Is this the last time a PS2 title will grace the cover of a major multi-platform gaming mag, or does the little black box still have some life in it yet?